Just before our break for the Thanksgiving holidays, we came together in our gathering to share thoughts about the things for which we’re thankful. You, our Cedar parents, were present with us, as we shared about the family and friends who make our lives safe and delightful day in and day out. I thank the earth for feeding my body. I thank the sun for warming my bones. I thank the trees for the air that I breathe in. I thank the water for nourishing my soul. Watch your email for a class video of us singing like angels. These are the questions we ask ourselves when we find ourselves intervening with the process of another. Sometimes our interjections are true and kind but unnecessary for another to find success with their work, whether that work is academic or social. It is in these moments that we learn self-restraint and trust in another person's capacity for growth, learning, and self-mastery. Montessori believed strongly that we must not do for a child that which she can do for herself. As Guides, we weave these two reminders into our daily practice with the children and do our best to model communication that we aspire to see within the children. This requires us to self-reflect on our own insecurities and practices of self-care. We also take the time to sit back and observe without criticism or judgment. This allows for the children to practice skills, both academic and social, and gain confidence in their abilities to care for themselves. 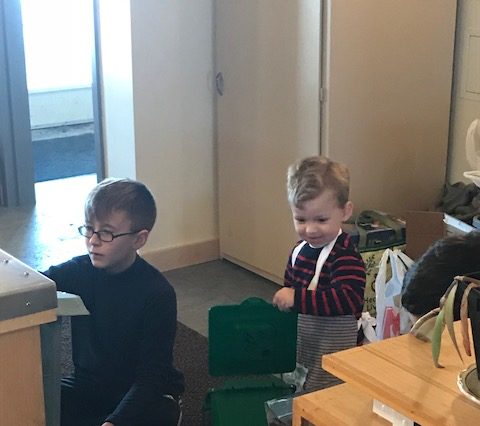 The challenges that the children face during this time of their development help to support them in developing perseverance and creative problem solving skills. This time in their development is an opportunity to develop skills that will support their success as adults. This process brings us back to our own sense of trusting in the cyclical process of growth: Observation, Patience, Trust.